It was summer 2014. I was married, had a wonderful 2 year-old boy and was working as a project manager in a building company. Everything was ‘OK’ though stressful. I thought it would be a good idea to start meditating to calm my general stress level. So, one evening I sat on the couch, closed my eyes and calmed down surprisingly good and fast. I thought: Oh wow, that is easier than I thought, and started to relax even more into it. And then something scary happened. My heart started pounding out of nothing, and I thought Oh sh*t, what have I done? Why is this happening? Did the meditation cause this? Etc. etc. and I started to get really, really scared. My heart was pounding so fast and hard that I could see it threw my chest. I was sure I was about to die. After a minute or so my heart rate started to calm down as well as my general sense of panic. I went to bed feeling confused and scared. This event left me with the irrational belief that I ‘did’ something to myself with this meditation. I was beating myself up for even starting it. I just couldn’t understand what has happened. This uncertainty created a high level of general anxiety, which got worse every day. The worse my fears, the worse the feeling of ‘I am going nuts’ got. The symptoms of derealisation and depersonalization didn’t help a bit. Let me tell you, to me, there is nothing worse than that! I found myself chasing something I didn’t even know what it really is. Looking back, this was not my first panic attack. I had one at the age of 11, after my parent’s ugly divorce. And another at the age of 20, after a stressful time. I just never knew those were panic attacks. I just thought that something is wrong with me. No one told me that I just had a panic attack. I was looking for answers in all the wrong places and I really got all the wrong answers, which drove me insane. Nobody understood, and how could they? I didn’t understand myself. I thought I did this to myself, not knowing what ‘that’ really is and how I could control it. I ran into a burnout and got into a 7 week rehab. The doctors prescribed me medication which I refused to take because I wanted to know what’s wrong with me and deal with it. As I told the therapist that my worst fear is that I am going crazy, she answered with: “Well, you see it seems to go in the direction of a psychosis”. That answer was enough for me to lose every bit of hope and I felt that I`d rather kill myself than experiencing that. Funny though, that with all that fear, which seemed to eat me up from the inside, deep down I knew, I am not crazy, I am not losing it! And I continued doing the best I could. I came home, made some dramatic changes in my life and managed to deal with the anxiety. Of course, I was functioning, I managed to live my life and developed in many ways for the better. From the outside, nobody would ever notice I had an anxiety problem-it was the complete opposite, people would see me as a strong and confident person and come to me for advice. Let me say, I tried EVERYTHING to heal my anxiety. Hypnosis, EFT, Meditation, Therapy, Sports, Energy healing, coaching, you name it. Some methods gave me a temporary relief, but the feeling of ‘Something is wrong with me, I am out of control and could go crazy’ never left me fully. But it got better with time. Though it had left scars on me. I had developed the fear that I can’t be alone with my son, cause what if I lose it? Of course, I still stayed alone with him and of course I never “lost” it and despite the fact, that my confidence as a mother was broken, and the pain about that was bad, I have been a wonderful mother all this time and I am blessed with a happy, healthy, confident child. This just shows once more, how irrational anxiety is and how it seems to pick out the very thing you love the most, to scare you with that. Fast forward to November 2016. I had an MRI Scan and experienced a full-blown panic attack being in that tube, which then triggered everything that has happened before. I started noticing all the ‘What if’ thoughts, my general anxiety spiking up and the ‘zaps’ in my stomach. But this time it would be different. I firmly made the decision that this time I will heal it. Though I didn’t have a clue how. So, I stepped outside the house and talked to the universe: Hey universe, here I am again, thanks for the opportunity to heal this. I am ready. I don’t know what to do, but you do know. And I won’t make a move until you deliver me a sign of how to heal this. I REFUSE to manage to live with it, there is a way and I want it NOW. I cried many tears of joy and relief hearing for the first time somebody telling me I am perfectly normal, that it’s ‘just’ anxiety. I had waited to hear this for years. I finally, after this tiring and hopeless journey felt, that I am at the right place, here I could heal, hear I could find myself again. I applied DARE immediately. This very new approach of going with instead pushing against anxiety was very scary in the beginning. It was not easy. It demanded all my courage, all my strength. But I was determined and nothing would stop me. So I defused, I allowed, I demanded more, I engaged. And in the beginning, it felt so fake! But fake it till you make it I said to myself. And after 3 days or so, a big shift happened. I started to feel more and more grounded. It had worked, that experience stuck with me, now I trusted this process more and more. No need to fake it anymore. After 2 weeks or so I had a setback. General anxiety spiked up again, I had another panic attack in the car wash and the fear that this will last forever came up. So I went back to the book. I read it again and started to listen to it while I was cleaning, driving, putting my make up on, just anywhere again and again. That has helped me A LOT. Then I was fine for another 2 weeks and then the next setback came. I went back to the book and I start working out again, taking my anxiety to the gym. This was a very helpful experience for me. That day I noticed that if I allow the nervous energy to be there, I could utilize it and use it to my favor. From that day on, I no longer was afraid of ‘zaps’ and nervous arousal anymore. I have noticed that one key factor for me was, NOT TO TRY to make it go away. This backfired always. It was always in my full allowance and conscious invitation of anxiety when it passed. Really experiencing that I am safe, that I am not losing control, that I am NOT going nuts, not MATTER how intense the energy and the thoughts get, was THE experience I needed to have to blast open the door to free my full sense of confidences and self-worth. All the things I have been holding back on, suddenly came into action and great things started to happen in my life. DARE has not only taught me to deal with anxious feelings but also with all my emotions. Life happens. We all experience anger, sadness, annoyance, grief, frustration, stress. DARE has taught me how to accept and move with these emotions instead of feeling threatened by them and therefor pushing them away as fast as possible. It’s fantastic, it brings so you much closer to yourself and boosts your confidence in your ability to take care of yourself and to handle whatever comes your way. You cannot teach a man anything; you can only help him to find it within himself. -Galileo Barry McDonagh and DARE are a game changer. Despite the fact that it works fast and profoundly well, the very best gift of DARE is that it teaches you that YOU ARE THE CURE. It empowers people, it makes them independent and helps them to develop a kind of strength and confidence that can never be achieved by people telling them how great they are. To fully be able to live the life we came for, we need to heal our anxiety. After that, EVERYTHING IS POSSIBLE. THANK YOU, BARRY I will FOREVER be grateful, forever and ever, for he has helped me taking back the most precious thing in life which anxiety stole from me, self-worth and confidence. 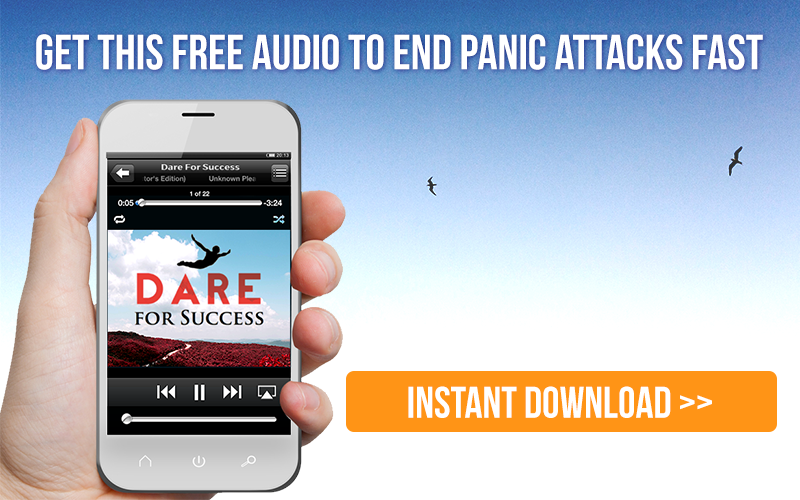 I highly recommend the DARE Response to anyone who suffers from anxiety and panic attacks. If I can do it, anybody can. The support and motivation groups as well as the DARE Audios are very encouraging and a big help on the road to recovery. Thank you…especially the part of being an excellent parent, but being afraid of going crazy when by myself with the kids. They are now 25 and 29 years old and successful, happy and we’ll adjusted. Thanks for sharing. It’s a pity the medical profession lacked such empathy and understanding. I applaude your strength for not giving up . Well done? Thank you! A big help. I am inspired by your story and today I will start Daring again because I want to write my success story here so that others will have hope. WOW Aida thanks for sharing your story. Dare really is a life changer!!!!! Thanks so much..It really helps. Extending my thanks to Barry foe sharing the books specially the one move technique….Youre a blessing…. Hi Susane. Thanks a lot for the success stories. I have been doing very well so far. I have tried to dare. Unfortunately I am getting setbacks after a week or 2 but believing that everything will be well especially when I recall where I came from with all panic attacks and anxieties I have gone through am still here’,,surviving! Please keep sending me the success stories as they really help me to keep daring! Wish can join the Facebook group but do not know as every time trying can not get in! This success story is EXACTLY what I needed to read right now, at this moment. I am currently in a setback, but reading these beautiful words makes me feel like my progress is normal and healthy. I am healing at the right rate for me, even though I think it should be faster. Thank you!!! That is so Fantastic! I am so glad you are doing so much better! Keep DARING your way through it. Your post gives us DARE newcomers an inspirational story that true recovery is out there. I’ve been at it three days now, and have had some successes with defuse and acceptance. And that has enabled me to engage more clearly. (The “run toward it” is probably the most intimidating.) I’ve had some failures too, and I know I haven’t really mastered the idea of full acceptance. But I can feel progress — just today, by accepting and riding the wave through a bad morning, I turned into a pretty good afternoon. Thanks again.